Politicians are not generally noted for their bravery. But the Democrats running in the fall congressional races may be taking cowardice to a new level. With almost no exceptions they are doing their best to avoid talking about the Affordable Care Act (ACA), the healthcare reform pushed through during the first years of the Obama administration. This is surprising because by almost every measure the ACA has been far more successful that could have been expected. The Democrats do have some basis for their fears. In the 2010 congressional elections the Republicans managed to pick up an amazing 63 seats in the House of Representatives, regaining control after the Democrats had enjoyed their largest majority in almost two decades. The Republicans had made "Obamacare" a central issue in that election, along with an economy that was recovering very slowly from the collapse of the housing bubble. This experience effectively left most of the Democrats shell shocked when it came to discussing the ACA. The bill had passed almost exclusively with Democratic votes, with only one Republican member of the House voting in support of the bill (after the bill already had a majority). Once the Republicans gained control of the House they made voting to repeal the ACA a regular order of business. On 47 separate occasions they voted to repeal the bill. They constantly highlighted fears about rationing, soaring prices, and death panels. The last item referred to an item in the bill, which was later removed, that including funding for consultations about end of life care for older people in bad health. The Republicans were successful in promoting fears about Obamacare because its main provision, the creation of state level insurance exchanges through which people could buy individual insurance, did not take effect until 2014. This meant that until 2014 the Republicans were large attacking something that people could not see. It easy for politicians to make things up about what people cannot see. After all, if your representative in Congress tells you that Obamacare is going to destroy freedom and the American way of life, who can say that's not true? Everything changes once the exchanges came into existence and Obamacare became a reality for tens of millions of people. After a malfunctioning website led to a disastrous start to the system, people began to enroll in large numbers. More than 8 million people had signed up on the exchanges at the end of the enrollment period, far more than the 6 million that had been projected. Furthermore, the vast majority of these people signed up for the plans rates as "silver" or higher. This meant that they were not just taking the lowest cost option as a way of avoiding the penalty for not being insured. The additional people insured through the exchanges, together with the people covered through the expansion of Medicaid, the government run health care program for low income families, brought the uninsured rate down to lowest level since 1997. It also turned out that costs are coming in far lower than had been projected. Healthcare costs began to slow in 2008. While they had been two to three percentage points a year more rapidly than GDP, in the last five years they have increased roughly at the same pace as GDP. This pattern of slow growth has continued into 2014, even with the expansion of health care coverage through the exchanges. In the first half of 2014, spending on health care actually ran somewhat behind overall GDP growth. Perhaps most importantly, there is evidence that Obamacare is ending the problem of "job lock," where people are afraid to leave a job because they are worried they will not be able to get healthcare insurance if they quit. There was a notable increase in voluntary part-time employment at the start of 2014. These are people who choose to work less than 35 hours a week. (Workers often have to work full-time in order to qualify for their employer's insurance policy.) The biggest increase was among young parents, indicating that many workers are opting to work part-time to be with young children. It will be an enormous gain if workers no longer feel tied to an employer because this is the only way they can get insurance. It is too early to say for sure that the ACA has succeeded on this issue, but the data to date are promising. In short, the ACA appears to be an enormous success. It has extended coverage, it has helped to hold down costs, and given workers the freedom to leave jobs they don't like. Ordinarily, this would be the sort of policy that politicians would fight over to get credit. But the Democrats apparently still have not recovered from their defeat in 2014. 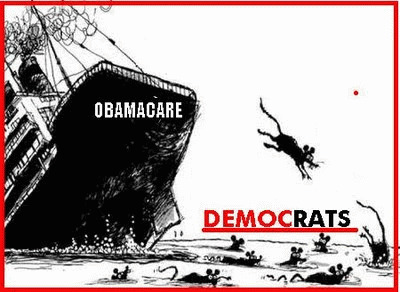 As a result they are running from Obamacare, instead of bragging about it.